We are trained in the PROMPT Method. PROMPT (Prompts for Restructuring Oral-Muscular Phonetic Targets) is a multisensory approach used with children with motor speech disorders, including dysarthria (low muscle tone/weakness), apraxia (speech programming difficulties), and articulation disorders. It can be used with clients with Down Syndrome, Williams Syndrome, Cerebral Palsy, speech-language delay, and autism, among others. 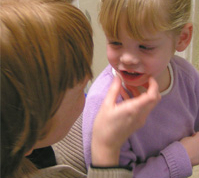 In the PROMPT method, tactile-kinesthetic prompts are used on the client's face to facilitate appropriate place, manner, and timing of speech movements. Speech targets are based on analysis of the entire motor system of the client. PROMPT is used to the teach precision and control of transitional speech movements that is difficult to learn through articulation and phonological approaches. Normal movement patterns, rather than the exaggerated patterns taught in articulation/phonological therapy, are facilitated. PROMPT also considers the overall cognitive and language abilities of the client, rather than simple sound, word, or pattern production. The overall goal of PROMPT treatment is greater speech intelligibility and improved overall communication skills. PROMPT can be used with children as young as six months. For more information, go to www.promptinstitute.com.